Jenna Elizabeth Johnson: Besides Writing . . . Cakes! I made for my sister's graduation from college. 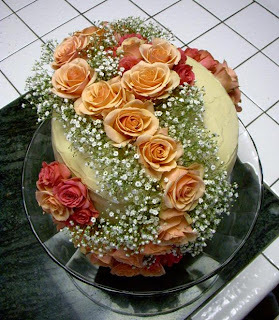 Among my many interests, I’d have to say baking and decorating cakes is one of my favorites. Perhaps it connects me back to the good old days when the idea of a cake meant birthdays and special celebrations. 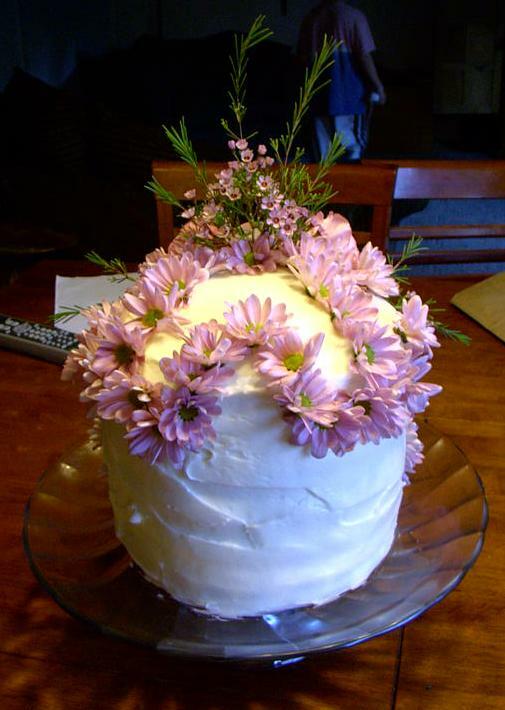 Maybe it stems more from my artistic side: putting together a layer cake and adorning it with flowers is basically sculpting with food, right? My use of live flowers in the decorating might play a part. I love plants, especially the colorful ones. Wait! I know! It’s because I get to lick the bowl and taste-test the frosting! Ah heck, let’s face it: I think it might be all four of those reasons. and red berries since it was for a winter critique. So, now that I’ve got a good list of excuses for making cakes, I’ll tell you a little bit about the process. 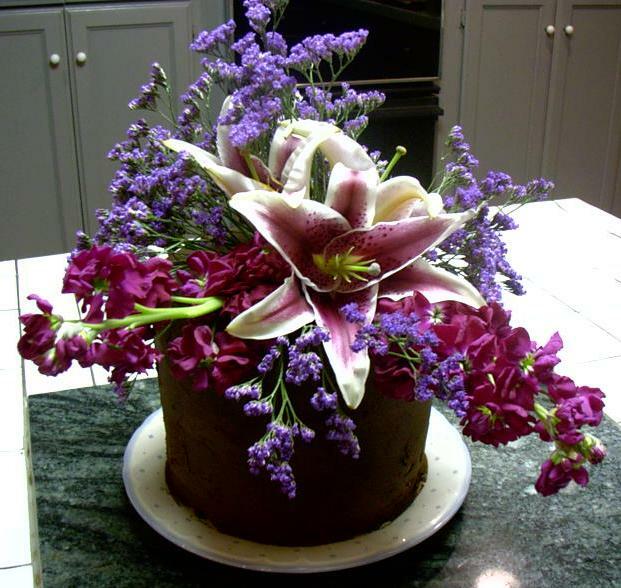 When I’m making a layer cake I plan to decorate, I NEVER make it out of a box (I know, I know, I’m a cake snob). All of my layer cakes are made from scratch. I think the reason I insist on making them from scratch is because it is more of a challenge to get it just right (I know this for a fact because I have yet to figure out how to make a white cake that isn’t dry). Mixing the ingredients and actually baking the separate layers are the easier steps of this process. Frosting it once everything is cool, however, can be a little trickier. Once I had someone ask me how I managed to get the layers together without making a mess of it. She said that she always got crumbs mixed in with the frosting. When I’m frosting the lower layers, I don’t really worry about the crumbs. They are going to be hidden by the other layers. What I do, however, to keep the crumb count to a minimum, is plop on a huge blob of frosting and then carefully spread it out so that the crumbs stay between the top of the cake and the frosting itself. believe it was for a fundraiser. Last but not least, I get to decorate it! This is the best part. I have no method when it comes to arranging the flowers; no pattern to follow. Usually I choose the flowers depending on what people ask for or what is available in the floral section of my local grocery store. Once the flowers are picked out, I’ll stand back and contemplate what I want to start with (the biggest flowers first). I’ll start sticking flowers here and there, and if they don’t look right, I’ll move them around. Eventually, I come up with something I like. Oh, and I always take pictures when I’m done ;). Most of my cakes are created for events: parties, graduations, fundraisers . . . that sort of thing. Every now and again I’ll get commissioned to make a cake, and I usually give people a choice of three cake flavors: chocolate with chocolate truffle frosting, gingerbread with caramel cream cheese frosting, or the most popular, carrot with cream cheese frosting. Until I can test out some more recipes and am happy with results, I shall stick to these three (I did recently make a pumpkin spice cake with cream cheese frosting that turned out rather tasty . . . ). In conclusion, I suggest that if you like baking, you should try making a layer cake using live flowers as a garnish (be sure to remove them before you eat). 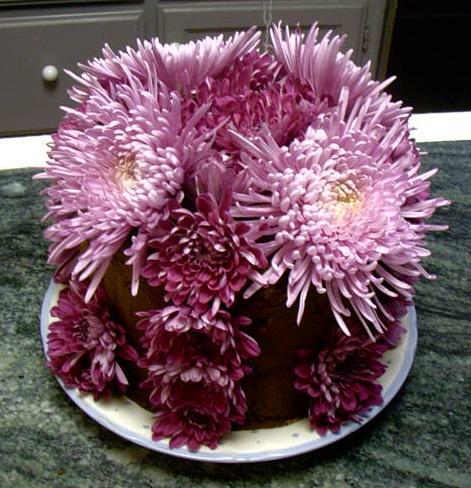 I know making a cake where everything is edible is all the craze these days, but in my opinion, I don’t mind taking all the flowers off before slicing the cake, especially if those flowers make it a work of art. 2. Make sure you spread the frosting evenly and to save most of it to cover the top and sides of the cake when you are done. 3. After frosting the first layer, add the others and frost them as well. Make sure they are even when you add them on. 4. When all the layers are added, put a large amount of frosting on the very top and carefully cover all the sides. Smooth the frosting out or leave it looking rippled. 5. Gather all your decorating equipment. I use the meat thermometers to poke holes in the cake so the stems of the flowers don't bend when I try to push them in :). 6. Here is a side view. At this point, I am almost done adding the flowers. 7. And . . . The final product! The stargazer lilies add a nice sweet scent as well ;). Poking the holes with a meat thermometer is brilliant.